Emory and CDC researchers have been examining immune cells obtained from four patients treated at Emory University Hospital in 2014. 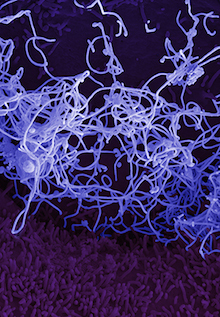 Image: Ebola virus isolated at NIAID Rocky Mountain labs. In the ongoing Ebola outbreak in West Africa, whose death toll is approaching 10,000, little information has been available about how the human immune response unfolds after infection. Researchers from Emory and the Centers for Disease Control and Prevention have now obtained a first look at the immune responses in four Ebola virus disease survivors who received care at Emory University Hospital in 2014, by closely examining their T cells and B cells during the acute phase of the disease. The findings reveal surprisingly high levels of immune activation, and have implications for the current effort to develop vaccines against Ebola. All four patients' immune systems showed strong signs of T and B cell activation, according to a paper published Monday in Proceedings of the National Academy of Sciences. Some previous research on Ebola virus disease had suggested that immune responses could be impaired. "Our findings counter the idea that Ebola virus infection is immunosuppressive, at least in the patients that we were able to study," says lead author Anita McElroy, MD, assistant professor of pediatrics (infectious disease) at Emory University School of Medicine and a guest researcher at CDC's Viral Special Pathogens Branch. "They also demonstrate the value that supportive care may have in enabling the immune system to fight back against Ebola virus infection." The paper emerged from a collaboration between immunologists at Emory Vaccine Center led by Rafi Ahmed, PhD, Aneesh Mehta, MD and Emory's Serious Communicable Diseases Unit team, and investigators from CDC's Viral Special Pathogens Branch, led by Christina Spiropoulou, PhD. Researchers from La Jolla Institute for Allergy and Immunology contributed to the paper. "Until now, detailed studies like this in acute Ebola virus disease were logistically challenging," Ahmed says. "Our work only became possible through a close collaboration with the CDC and use of its biosafety level 4 facilities." Each patient's level of immune activation reflected the relative intensity of their illnesses. "All four patients have been enthusiastic about participating in research to further knowledge about Ebola," Mehta says. "They have voluntarily donated blood on multiple occasions as part of this research study." Out of the four patients, the first two became very sick, the third was even sicker and required renal replacement therapy and respiratory support, and the fourth had a milder illness in comparison. While hospitalized, the first three of the patients displayed lymphopenia, or low levels of immune cells in their blood. However, an extraordinarily high proportion of their B and T cells were activated, researchers found. The immune activation continued even after the virus became undetectable in the blood and patients had left the hospital, suggesting that Ebola antigens persist in the body for several weeks. Scientists tracked patients' B cells, important for generating antibodies against the Ebola virus, and cytotoxic CD8+ T cells, which directly kill infected cells. The patients' CD8+ T cells targeted several proteins, and a major target was an internal Ebola virus protein called NP. However, vaccines now entering clinical trials in Africa contain only the external glycoprotein called GP. This suggests that NP could be added to existing vaccines to generate stronger T cell responses. "CD8+ T cell responses have been associated with vaccine protection against Ebola infection in some animal models," McElroy says. "But the relative importance of T cell responses, compared to antibody responses, in driving survival and vaccine efficacy in humans is not known. We anticipate it will be an active area of research in the future." Ahmed is a Georgia Research Alliance Eminent Scholar. The research was supported by the Defense Advanced Research Projects Agency (W31P4Q-14-1-0010) and the National Center for Advancing Translational Sciences (UL1TR000454).